Margaret “Marge” Ann (Sudbeck) Connealy was born in Hartington, Nebraska to Ed and Dora (Leise) Sudbeck, on September 6, 1928. She passed from this life into eternity on January 21, 2019 at the age of 90 years. Marge was the youngest of two daughters and grew up in Hartington on a farm, helping with chores and harvesting the corn crop by hand. After graduating high school, she attended beauty school and earned a certificate for her beauty license. On June 28, 1949, Marge married Emmet Paul Connealy and to this union were born 7 children. They made their home in southwest rural Decatur, Nebraska, north of the Connealy family farm. 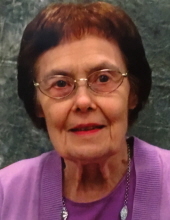 She was a devout member of Holy Family Catholic Church in Decatur for over 60 years. Marge loved to play cards and competed in a bridge club in Oakland, Nebraska; she was also a great canasta card player. Marge enjoyed doing hand work. She knitted and crocheted afghans that she gave away. She was a wonderful cook and made everything from scratch in her younger years. She was well known in her family for her delicious popcorn balls, caramels and peanut butter iced cinnamon rolls. Marge was preceded in death by her parents; sister, Celestine Fuks; husband, Emmet; son, John (Eddie) Connealy; daughter, Mary Lynn Connealy; grandson, Colt Penny. Marge leaves behind four daughters, Jeanine (Jay) Reischl of Omaha, NE, Jane Connealy of Denton, NE, Debbie Connealy of Milford, NE, Peggy Connealy of TX; son, Dave (L J) Connealy of Decatur. Marge’s legacy also includes 18 grandchildren; 35 great grands and 1 great great grand. Marge lives on in many hearts. We love her and thank her for 90 years. Family will receive friends 5-7 pm, with Rosary at 7pm. "Email Address" would like to share the life celebration of Margaret Connealy. Click on the "link" to go to share a favorite memory or leave a condolence message for the family.